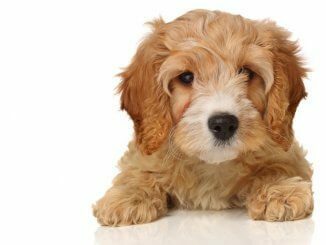 Standing at between 12 to 13 inches, a soft coat, droopy ears, and big brown eyes, the Cavachon is a petite and loving breed. A kind and gentle dog bred by mating the charming Cavalier King Charles Spaniel with a petite yet smart Bichon Frise; this pooch will fit perfectly into many different lifestyles from farm, city and even the retirement. A Cavachon Dog makes the perfect companion for families big and small; being hypoallergenic, friendly and kind. Playful and loving, yet an intelligent little dog, could they be the right dog for you? Color Variations White with black, apricot and tan markings. This puppy is born when a Cavalier King Charles Spaniel mates with a Bichon Frise. This is known as a first generation. On the other hand, a second generation puppy is bred from two first generation parents mating. 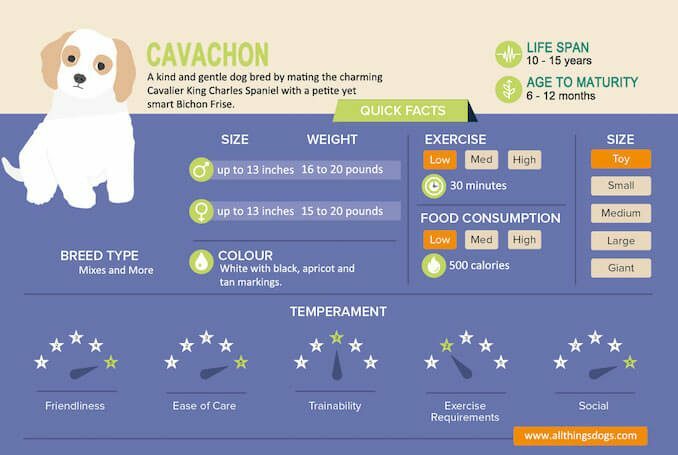 Free eBook: Download your free Cavachon eBook to get more information on this designer dog. 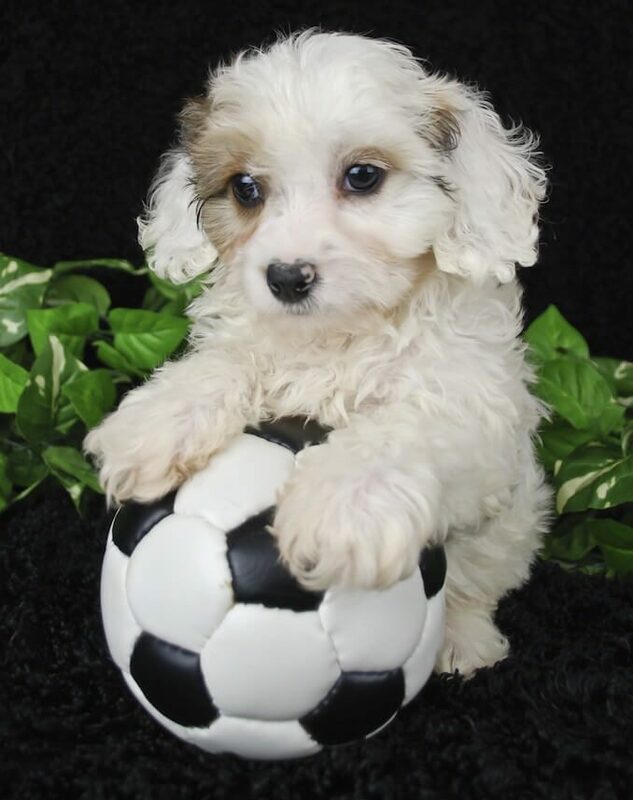 The litter size of Cavachon puppies varies from between two to six puppies and their appearance may vary due to the appearance and markings of their parents. An example of this is their coat which can be rather unique with each individual pup showing completely different markings. 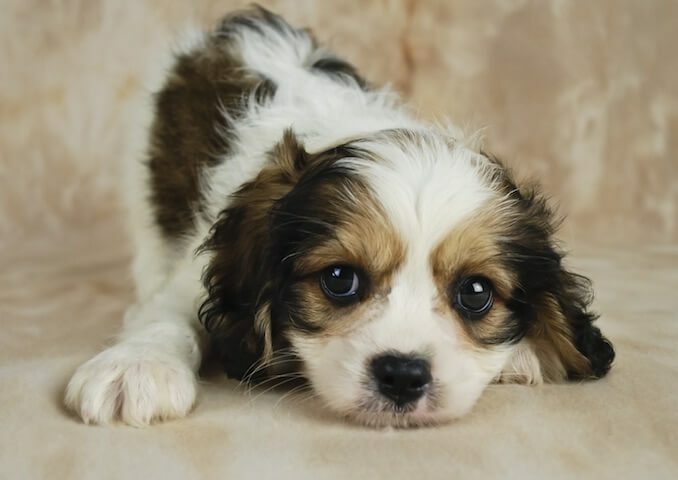 The Cavalier King Charles Spaniel and Bichon Frise mix originated in 1996 and they are believed to be first bred and introduced by the Gleneden Kennels in Virginia. Although these breeds are impeccable on their own, and very popular, the goal was to create a hybrid breed which was hypoallergenic. Like the other famous Cavalier King Charles Spaniel mix, a Cavachon dog’s size places this dog in the toy dog breed group. Being a hybrid dog, they are not recognised by a major kennel club (like all hybrid dogs). Today, this toy dog has grown in popularity world-wide, with high popularity seen across the pond in Ireland and in the United Kingdom. Bred from two purebred toy dog breeds; this dog will stand at between 12 – 13″ tall. The Cavachon has a lifespan of approximately 10 to 15 years, for a toy breed dog this is average. A full grown Cavachon will stand at around 13″ tall and weigh between 15 to 20 pounds with both the males and females similar in size. The cost of buying Cavachon puppies changes significantly, with a puppy ranging anywhere between $800 and $1,600 USD. The range in cost is due to different breeding standards (e.g. purebred studs and dam welfare). Being a designer dog breed, it is not uncommon to come across many unreliable breeders. It is important to find a responsible breeder in order to reduce unwanted health problems or other unwanted obstacles. Overall, they are a very good-natured companion and have a good personality. Those big brown eyes mixed with a sweet loving temperament are sure to win you over. Their temperament is very understanding and mellow therefore making them a great companion for children, as they have a lot energy and patience. As they are a toy dog breed, they require limited exercise and make a great little friend for any elderly person. This dog is very adaptable and can suit most living situations; from small apartment living to family living and even country-side living. The Cavachon is a sociable little pooch who loves to meet and make friends with new people. Regardless of species! Human, dogs and even cats, you name it. Because of this, it’s important that as puppies these dogs are well socialized (more on this below). These dogs love to bond with humans and are extremely loyal. They will love you as much as you love them. These dogs aren’t the most demanding when it comes to grooming and caring for them because of their small and easy going demeanor. How Much Does a Cavachon Eat? Whilst a small dog, they don’t have the smallest of appetites. As with any pet, it is important to steer clear of any unwanted weight gain. I know what you’re thinking… with those big brown eyes, who could say no? Just one more treat! Remember, your Cavalier King Charles Spaniel and Bichon Frise mix doesn’t require that many calories a day to meet their requirements. On average, a dog around 15 pounds, requires approximately 530 calories per day is more than enough. However, this may change depending on your dog’s individual the age, size and activity level. Once matured they will only eat about one cup of high quality dry kibbled food per day. There are high quality food products available which are specialized for the toy dog breeds. These are highly recommended. These products will contain the correct amounts of proteins, and fats your pup will need. 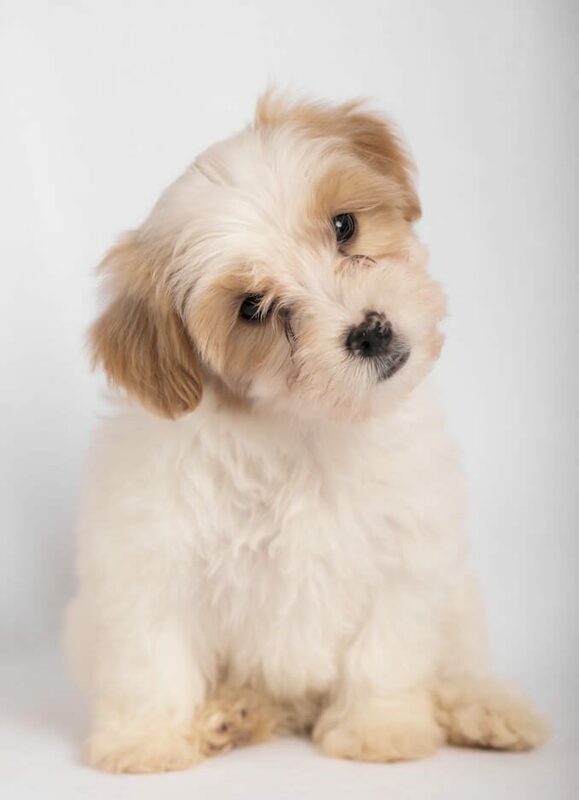 Your Cavachon is a small dog and therefore splitting up their meals throughout the day will help them digest their food efficiently as well as keep them satisfied; perhaps two or even three meals a day. You can also give your dog treats especially after they’ve behaved so well; maybe some tasty shrimp? Just remember, not too many snacks and always monitor the snacks you feed them and reduce their meal size if necessary. Meeting the exercise requirements of a Cavachon is relatively easy; especially if you have a nice yard for them to play in. Exercising and bonding with your dog is an important part of training your pooch. This dog only requires around 30 minutes of walking per day with no intense exercise required. So all you really need to do is get your walking shoes on and go for a nice neighbourhood stroll. A couple of laps around your local dog park? Exercise and socialization will then be provided in just one trip. However, it is important to note that these little pups do not stand cold weather well. So when you go for your daily stroll in winter then perhaps a little sweater from the local pet store could suffice? We don’t want anyone turning into a pupsicle. Being a small dog, without proper guidance and training, a Cavachon Dog is at risk of developing small dog syndrome. However, as they are an intelligent breed, simple training is not at all complicated. In fact, they learn very quickly and can learn some advanced training techniques. Try keep training sessions gentle, short and sweet so that your puppy remains stimulated during sessions and doesn’t get overly bored. Positive reinforcement and patience is all your pup will need in order to develop into the charming and polite companion you desire. Socialization is key when it comes to the Cavalier King Charles Spaniel and Bichon Frise mix, being a toy breed, they will show a tremendous amount of love and affection to their owner. Great socialization activities include dog parks, trips to the beach or even doggy day cares. They are extremely sociable and are able to adjust to many different environments, provided they are correctly socialized. Doggy day cares are highly recommended. Here, your puppy can run around in a safe environment and play with other dogs from a range of breeds. Much better than having them stay inside or in your back yard when you’re at work! In addition to training and socializing, mental stimulation will help to keep your pooch well rounded. Mental stimulation can be easily provided. If your dog is kept inside for long periods each day, then simply taking them on little outdoor adventures will help. Going out and actually playing with your pooch will also provide mental stimulation positively influencing both parties. Remember, any dog that becomes bored can become a menace. They don’t require intense mental stimulation. They are perfect companions and therefore they do not mind snuggling up to you after a long day. They will provide you with all the kisses, licks and cuddles you need after a very hard day; after all, this is a breed known for their sweet, charming persona. Unfortunately, like all hybrid dogs, there is a chance of your pup inheriting an unwanted health problem from their purebred parent. Generally, health problems in dogs are inherited from their parents or breed. Therefore, it is key to be wary of any diseases which the parent breeds may be predisposed to. A heart murmur is an irregular noise made when the dog’s heart beats. This can be an indicator of other diseases such as Mitral Valve Disease. Surgery or medication may be used as forms of treatment. However, it is important your dog has regular Veterinarian checkups to ensure your pup is healthy. This is especially true as your dog ages, just ask for a Senior Panel Membership. Atopic Dermatitis, is a common allergic skin disease which is seen in many dogs. This may occur in response to environmental (e.g. pollen or plants) or chemical (e.g. food or medication) factors. Your hybrid dog may be more susceptible to certain allergens and will therefore become very red and itchy. This will be very uncomfortable for your pup and therefore it is recommended to see a Veterinarian as soon as possible for your options. 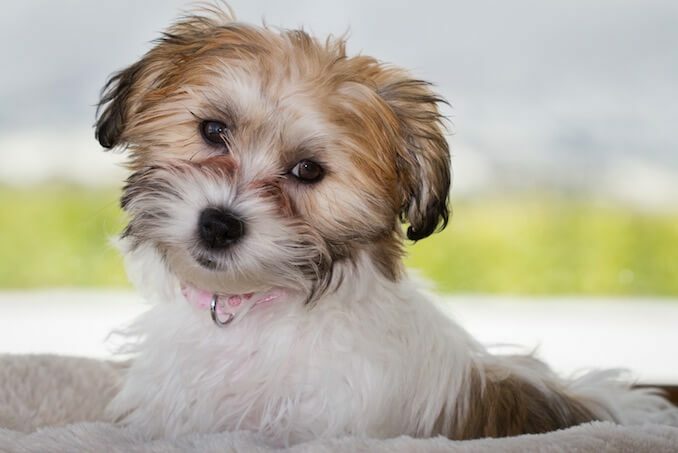 The Cavachon is a beautiful, royal looking breed. It only makes sense with such purebred and charming parents. Both male and females range from between 12 to 13 inches in height. However, in terms of weight, the female is slightly lighter at 15 to 20 pounds (compared to a 16 to 20-pound male). Like most designer dogs, there are no breeding standards so their appearance can differ quite drastically between litters! However, they are still fairly recognisable. One of their most infamous features would have to be those large brown eyes. Secondly, their body. Small and compact. 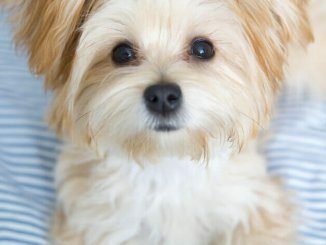 The Cavachon Dog is a small dog with a proportionate body covered with a beautiful coat. They have a medium, soft, silky and slightly wavy coat. Again, as the litter varies, some may actually even have straight and short hair. This coat comes in different colours. However, like the Bichon Frise, their coat is most commonly white. However, they have plenty of unique markings which may be black, tan or even apricot. Let’s not forget their ears! They have long beautiful and soft ears resembling their parent, the Cavalier King Charles Spaniel. These gorgeous ears hang sweetly beside their head. Grooming your Cavachon should be fairly simple as the breed itself was designed to be hypoallergenic and therefore a low-shedding breed. Don’t let this fool you, because although limited, some maintenance is still required. Even in low maintenance dogs, it’s important to groom and care for your dog to help bond and create trust. Normally, with a coat like this, owners take their dog to the groomers every four to eight weeks. Here, ears and eyes are cleaned lightly, plus your dog will get their nails clipped. At home, care and grooming is also beneficial. Brushing your Cavachon will help reduce any shedding which may occur. Plus, it will keep your pup’s hair tangle free; try brushing between two to three times a week. In addition, keep their eyes free of goo. Tip: Start grooming activities early on in your pup’s life so that he or she is accustomed to you touching his paws and brushing through his fur. Your dog will then be much more tolerable of grooming practices and may even like it. 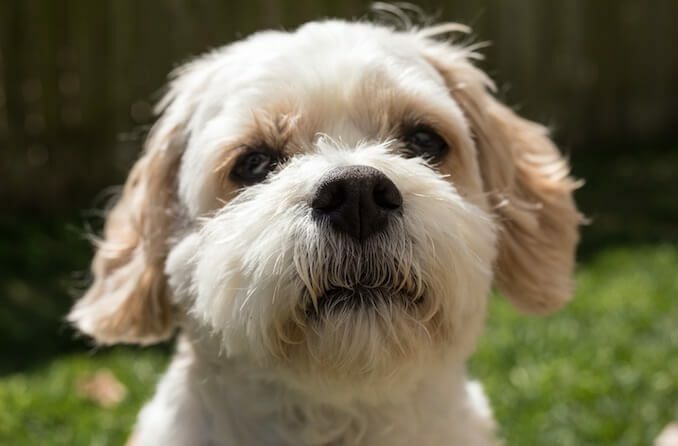 Is the Cavachon dog the right breed for you? Royal in appearance, intelligent yet down to earth and extremely loving. The perfect playmate for any family. A great sidekick for any individual. And, a precious companion for any senior. Limited grooming requirements, 30 minutes of exercise per day, a bit of TLC and the Cavalier King Charles Spaniel and Bichon Frise mix can be the perfect dog for you. Who wouldn’t want to come home and see those gorgeous big brown eyes, floppy ears, soft wavy fur bouncing around to greet you at the door? Go on, share your opinions and let us know how this loving breed will fit right in with you in the comment section below. A Male or female would become a welcome family member. Are they available for purchase. Thanks. We are a dog publication, you would be best served researching breeders in your local area, you can start by reading our guide on Finding a Responsible Breeder.